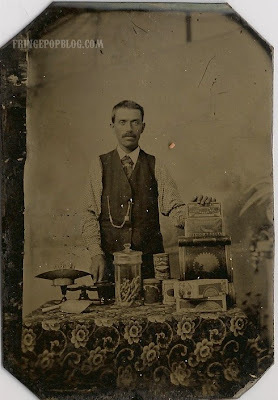 My father found this tintype of a merchant in an antique store in Grand Forks, ND. At the time, my fiancee and I (who are both photography collectors) lived there and never found a single thing at the one antique store in town. Generously, my father decided to give us this photograph as a gift, having seen us admire it over and over again. It really is a nice piece. It isn't often that you see tintypes with themes such as this. I love the clarity of the image and the props the man is posed with. Maybe it will be my later in life hobby. I don't have any children to worry about. Just 10 rats in a cage and a housecat! ; - ) LOL. Wow, that's a really nice occupational!